Guy, Lord Keating, laden with his father's debts, elopes with "heiress" Emily Duprey…only to discover she is as poor as he! Now his only hope of saving his family and dependents is a reluctant return to the gaming tables. Emily has to escape marriage to a gamester like her father. But she needs more money than she can win as Lady Keating—so she becomes Lady Widow, a card-playing masked seductress! Then Guy recognizes the beautiful Widow as his quiet, mousy wife—and their inconvenient marriage takes an unexpected turn…. Barely able to make his mouth work, he finally responded, “I, Guy Keating….” His words sounded like a funeral dirge. What the devil was he doing in this place, speaking these words? The final vow nearly caught in his throat. Guy tried to give her a smile, this woman whose appearance was as unremarkable as her personality. She was neither short nor tall, thin nor stout. Her hair, worn with curls framing her face, was in the popular fashion, though its color was the same bland brown as her dress. He could never quite recall the color of her eyes, but whatever color, her eyes did not enliven her always composed face. She gazed at him, almost a question in her expression, but not quite that animated. He ought to be flogged for bringing her nearly four hundred miles, to court scandal for them both at Gretna Green. Oh, he might tell himself she was better off wed to him than having her fortune gambled away by her wastrel father or plundered by one of the rakes who had lately been courting her. Guy had a much better use for her money. Did that not make him less reprehensible than those gentlemen ready to exploit her for their own gain? Certainly less reprehensible than her father, Baron Duprey, who was as addicted to the roll of dice as Guy’s own father had been. Guideman, indeed. Pretender, perhaps. Deceiver? Rogue. Guy jerked up his chin. He’d forgotten about this part of the ritual. He had kissed her once, upon proposing, because it seemed what he ought to have done, but he’d not thought of kissing her since. She colored and glanced shyly at him through her lashes. He leaned down and placed his lips on hers. God help him if her lips did not seem expectant, as though she anticipated more than this sham of a marriage could deliver. She deserved more, after all. “Now shall we go on to the inn, then?” The anvil priest waggled his brows. The inn was another of his enterprises, no doubt. Guy swallowed. He had not forgotten they were required to consummate the marriage. Would she be as hopeful on that score as with the kiss? He offered her his arm, “Shall we go, my dear?” What he meant to say was I’m sorry. He escorted her around the puddles left in the street from the afternoon’s rains. What sunlight that appeared that day waned in the sky, slipping as low as his confidence. He’d once thought this the wisest course, but now he felt like the veriest blackguard. A wide puddle of water blocked the entrance to the inn, not a problem for his boots, but deep enough to dampen the hem of her skirt. He scooped her up and carried her over the threshold. Her face remained subdued, but she trustingly settled in his arms, feeling to him almost as a wife ought. He made a vow more genuine than the ones he’d repeated after the anvil priest. He vowed to be a good husband to her. He vowed she would never know the truth of why he’d married her. Their meal was a stilted affair, the two of them confined together in a private parlor. He tried his best to be as solicitous as a new husband ought. “Would you like some fish, my dear?” he asked. “Do you care for another piece of tart?” “Shall I pour you another glass of wine? And he responded as he ought. “Very delicious… very sweet.” In truth, he could not taste the food at all, and he’d availed himself of the innkeeper’s whiskey far more than was prudent. Surely all their future meals together would not be so excruciatingly dull. After they finished the last course, no other choice remained but to climb the stairs to the bedchamber the anvil priest/innkeeper had promised them. Guy’s boots beat like a drum against the worn wood of the staircase, matching the loud tattoo of his heart. He’d had his share of bedding women. Any man in regimentals was bound to, after all, but those simple exchanges were honest ones. How could he bed Miss Duprey—his wife, he meant—when he’d kept the truth from her? He’d feared she would not marry him if he had been totally honest about needing her fortune, though many a ton marriage took place for that very reason. The innkeeper led them down a hallway to the bedchamber where a cheerful fire flickered in the hearth. The oak floor was covered with a figured rug, and a large bed, its linens turned down, dominated the room. A bottle of wine and two glasses sat on the small table next to it, and a branch of candles further illuminated the charming scene. Miss Duprey—his wife, he meant—wandered over to the window and stood peeking through the gap in the curtains. She still held her hat and gloves as if not certain of staying. “I weel leave y’, good sir.” The innkeeper gave Guy a broad wink and grinned wide enough to expose a gap between his teeth that had not been visible during the brief wedding ceremony. The thud of the closing door broke the silence, while Guy’s disordered emotions continued to rage inside him. Miss Duprey—his wife, dammit! he must recall—turned at the sound. Her eyes were wide, but her countenance composed. She clutched at her hat, crushing its ribbons. He tried to smile. “Do you care for some wine, my dear?” “Thank you,” she said. He poured two glasses, wishing it were the good Scottish whiskey instead. She glanced around and finally found a bureau upon which to place her hat and gloves. With hands clasped like a schoolgirl, she walked over to the bedside table. He handed her a glass and took one himself, almost raising it to his lips before he caught himself. He ought to make a toast. His mind raced to think of something, hoping he did not appear as witless as he felt. Her expression conveyed no hint that she guessed his thoughts. “To our future… ,” he managed, clinking his glass with hers. “Yes,” she replied in a whisper. Their wine consumed, he stared awkwardly. She made no move. He supposed it was his responsibility to decide how to go on. “Do you desire me to call a maid to assist you?” he asked. “I could step downstairs to allow you some privacy.” And consume how many whiskeys while she readied herself for her wedding night? She shook her head. A wave of panic rushed through him, the latest of many on this day. Would he be able to perform his husbandly duty? How ironic. Perhaps he would provide her the means to have the marriage annulled. One could almost laugh at the thought. She was a well-enough appearing female. There was nothing to object to in her. So why could he not dredge up some modicum of desire? Guilt prevented him, of course. Lying to her, telling her that her father refused permission when, in truth, he’d never approached the man. Guy had tricked her into this flight to Gretna Green, leading her to believe there was no other way for them to wed.
Ah, the bed sheets. Some chambermaid or another would be changing the linens and noticing the lack of evidence. Would that create any difficulty? He failed to see why any of these people would care. They’d been well paid. What’s more, she could easily be a widow or something. He shrugged. He’d come too far to take a risk now. “I could contrive something.” Blood was a ready commodity, as any soldier knew. He might pierce his arm above his sleeve, bleed on the sheets and no one would be the wiser. “I am willing to proceed,” she replied. How was she able to keep her tone so temperate? She might as well be conversing with afternoon callers, but he, on the other hand, felt his voice might crack and fail him at any moment. Her expression remained equally as mild as her fingers reached for the buttons of her spencer. He watched her free each button and pull off the garment. Placing it neatly on a chest at the end of the bed, she reached behind her back and struggled with her laces. He closed the distance between them. Feeling as if he were perched on the ceiling observing himself, he undid her laces and slipped the dress off her shoulders. She remained as still as a statue as it slid to the floor. His fingers trembled when he set about removing her corset, but he soon had her free of that garment as well. She turned to face him dressed only in her shift. Perhaps if she conveyed some emotion, he might be more easy in this moment, but she was as colorless as she ever had been. He held his breath, watching her take the pins out of her hair and wondering how the devil he was going to be able to perform. She ought to have a husband who greeted this moment with joy instead of obligation. She ought to run from him now and deny there had ever been a wedding. Bribe the avaricious anvil priest to destroy the marks in the register and hire the fastest post chaise back to Bath. Such spirit, he could not blame. He might even admire it, but her compliance made him feel like a cad. Taking a deep breath, he sat down on the bed to remove his boots. Emily stood by the bed, watching her husband as she smoothed her hair neatly behind her shoulders. She could not recall ever seeing a man remove his boots, even her father and brother, but certainly they would not have done so with the same masculine grace as Guy Keating. Her heart fluttered at this intimate sight of him. He was by no means the tallest of gentlemen, only perhaps five or six inches above her own height, but there was such an air of compact energy about him that he seemed to take up more space. That first glimpse of him came back to mind, in the Pump Room, her eyes drawn to him almost of their own accord. He had been leaning down to speak to two elderly ladies whom she now knew were his mother’s aunts, an expression of acute tenderness on his face. That look alone had disarmed her. When he’d picked up one lady’s shawl and wrapped it lovingly around her shoulders, Emily had thought she would weep for the sweetness of the sight. Later that week at the Assembly he had walked up to her at her brother’s side, having begged an introduction. To her. Emily still marveled at it. 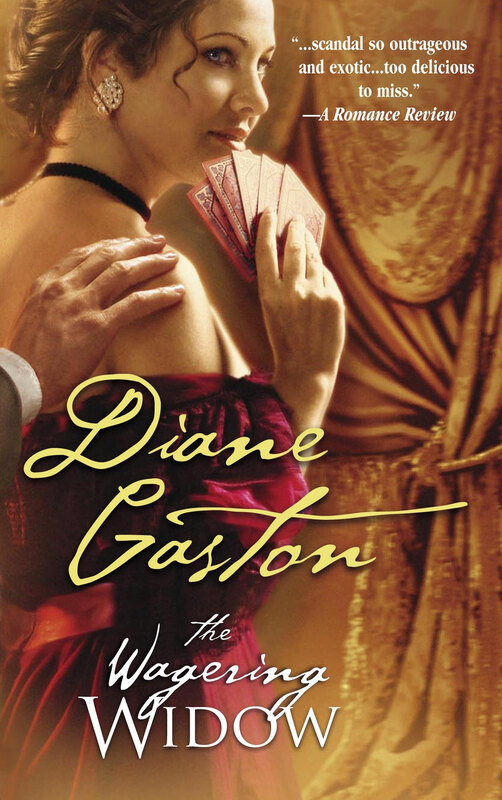 Gaston’s tale of a marriage in trouble and a plain but honorable heroine coming into her own pulled me in from the very beginning. Likable characters and the author’s gift for creating a believable world made this book a winner.—Lynn Spencer, All About Romance. During the English Regency (1810-1821) gambling was a popular pastime. Cards were played in the family parlor, at parties, balls, gentlemen’s clubs, and in gaming hells, those dens of iniquity where huge fortunes could be won and lost at the toss of a card or roll of the dice. I wanted to set a story in a London gaming hell and that is how The Wagering Widow came about. There was only one small problem. I didn’t know how to play the games played during Regency times. My research revealed that there were several card games popular during that time period. Whist was perhaps the most popular, a game played by four players, similar to Bridge but without the bidding. Whist worked well for many scenes in The Wagering Widow, but I also needed a card game for two players (read The Wagering Widow for this racy scene!) Piquet fit the bill perfectly. Unlike Whist, where the rules are fairly simple, Piquet is complex. The player must remember a complex set of points, keep track of both runs, sets, and the cards that have already been played. I read the rules, but I still could not understand how to play. Searching on the internet for one more website that might explain how to play Piquet, I came across meggiesoftgames.com. Meggie Soft Games offered a demo version of computer card games, and one of their games was Piquet! I downloaded the game and with the helpful hints provided, I was soon able to play. I enjoyed the game so much, I ordered it. What’s more, they also had a game called German Whist, a two-handed version of Whist, also fun to play and similar enough to the four-handed version to get a real flavor of it. When I needed to write about a specific game of Piquet, the types of hands Emily and Guy held, I simply based it on a hand from the computer game. The MeggieSoft Games can be played with online players, but I never tried that option, not wanting interaction with unknown people and their computers. Besides, playing against the computer had been challenging enough. You have to assign yourself a name when you play the computer games. The name I chose, and still use, is Emily, the name of the heroine of The Wagering Widow.